Travel back in time following the ancient Zagoria pathways!Travel back in time following the medieval Zagoria caravan pathways into a land of myths, tales, and ballads. This ride follows in the tracks of King Ilirian Skerdilajd, on his way to conquer Kaonia 2,300 years ago. 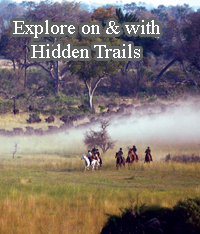 Experience unspoiled nature, colourful culture heritage, and welcoming people on the back of reliable, strong horses. Riding along Vjosa River – the last wild river of Europe.This trail combines a challenging riding experience in different landscapes with many possibilities! Join us on a very special horseback expedition, trekking from Argentina into Chile!Your journey will start in the Northern Patagonia region of Argentina, from a 15,000-acre cattle estancia nestled in the beautiful Andean foothills, just 45 miles from the city of San Martin de los Andes. Corrientes is still a place where gauchos regularly drive cattle and horses from one place to another. It's still a place where men calculate their distances in terms of the hours they think they'll need to ride them.